Selling gift cards for Christmas presents, Birthday presents, and other occasions is a great way to encourage families to spend money in your pro-shop. What makes selling and redeeming gift cards tricky is ensuring you are only recording the revenue once - when the gift card is purchased. Gift cards mentioned in this article are gift cards being sold by your organization. If you are looking for information on Visa gift cards, check out our related FAQ. What is the best process for selling and redeeming gift cards? See our Help article for more information on how to add drop-down values to your database. You can use the same process for selling and redeeming gift certificates in Jackrabbit. Use the word ‘certificate’ where we mention ‘card’. 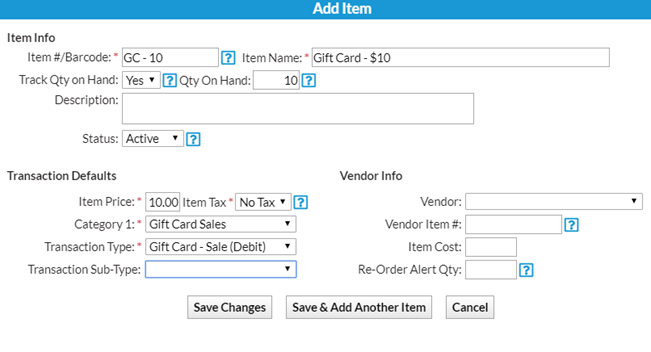 Once you have the drop-down values, you can add the gift cards in various dollar amounts to the Store as store items. After your gift cards are added to the Store, you are able to sell them to the general public or a specific family in your database. Now you are ready to sell your gift cards! You can sell the items to your store account if the buyer doesn’t have an account in your database. If the family already exists in your database, you can sell the item to that family. Make sure you have an item added to your store for the amount the customer wants to purchase the gift card for. If you would like to track the sale and redemption of individual gift cards by a specific ID number, you should make sure that all gift cards have a unique number assigned to them and add a note to the item when purchased. When it is time to redeem the gift card, the process is the same as posting a non-monetary credit (Groupon, Scholarship, Barter, Fundraiser, etc) to an account. If you are tracking specific ID numbers for your gift cards, you should add that same number to the Note field of the credit posting. Need to pull a report on gift cards sales and redemptions? Use the Sales Detail report to see gift cards sales. To see both gift card sales and redemptions, use the Transactions Search to search for Transaction Types of Gift Card - Sale (Debit) and Gift Card Redemption (Credit) .